Sen Plex Corporation is a locally owned and operated commercial contracting company providing HVAC, refrigeration, plumbing, and sheet metal services. 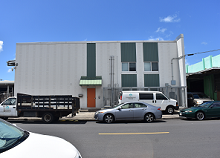 From the humble Oahu Plumbing and Sheet Metal shop founded by Francis Sen in 1945, the company has grown from 4 workers into one of Hawaii’s largest and most respected commercial contractors thanks to its family atmosphere and company stability. Over the past 65 years we’ve worked on most buildings in Hawaii from residential to commercial to governmental, including the Hawaii Convention Center, State Capitol, Ward Centers, and Tripler Medical Center. Now in its 3rd generation of family ownership, Sen Plex Corporation is still consistently listed as one of the Top 250 Hawaii Businesses. As a full service mechanical shop, we strive to provide fast and efficient installation, maintenance, repair, and fabrication services along with excellent customer service. We are grateful to have served the people of Hawaii and look forward to serving you in the future. We provide the highest quality air conditioning service to customers of all sizes. Extend the useful life of your equipment while maximizing your ROI. Oahu Air Conditioning Service (OACS) is also known for its high quality service and customer satisfaction. Our highly trained technicians will help to extend your equipments useful life. With our experience and specialized factory training, we are able to diagnose problems quickly and efficiently. Our team of technicians, estimators, project managers, and engineers are foundation to the largest a/c service department in Hawaii. With fully staffed offices on the islands of Oahu, Maui, Kauai, and Hawaii (Hilo & Kona), help is just a phone call away. For Statewide Emergency Services, please call (808)848-0156 to speak with a live customer service representative. From plan and spec to design build construction, we have the experience and expertise to take on small to large scale construction and renovation projects. Oahu Plumbing and Sheet Metal (OPSM) has been one of the leading mechanical contractors in Hawaii for over 65 years. The company has completed a wide variety of projects of all types and sizes and is especially successful in complex projects that require high technical skills and quality installation. We are capable of handling small to multi-million dollar large scale projects. Our construction experience includes working on high-rise buildings, City / County / State / Federal government facilities, hotels and resorts, wastewater treatment facilities, residential condominiums, hospitals, schools, airports, and more. Our services include plumbing, air conditioning, fire protection, custom sheet metal fabrication & installation, architectural flashing, louvers, metal roofing, metal sidings, and industrial piping fabrication & installation. Reduce your project stress by utilizing all of our in-house services including drafting, sheet metal fabrication, commercial / industrial plumbing. Running your project without stressing is no easy task. Especially with unforseen problems lurking around every corner. Instead of your communications getting lost in translation each time it travels from you to your subcontractor's subcontractor's subcontractor, use Oahu Air Conditioning Service and Oahu Plumbing & Sheet Metal for all your mechanical needs. Statewide, we are able to assist you with all your mechanical contracting needs anytime -- anywhere. To provide Hawaii with valuable mechanical contracting services while maintaining our core values of honesty, integrity, tradition, and professionalism. Sen Plex is home to a large number of highly qualified individuals -- from factory trained technicians to certified professional engineers. The technology in this industry is constantly progressing. We are committed to our craft and attend annual trainings to stay up to date. Our dependable technicians are on call 24 hours a day to respond to your air conditioning or plumbing emergencies. Appreciation for 65 years of outstanding loyalty, dedication and service to the GCA and Hawaii's constuction industry. Awarded first place for best air conditioning repair. Consistently ranked as one of Hawaii's Top 250 Businesses.